Even the most unassuming things by day can be exceptional at night, especially freaks, although according to Whodini, that's pretty much the only time they ever come out. Also, only coming out at night: Yatai at Breadbar. Yatai's a six-week-long, nighttime-only popup restaurant at the 3rd St. location of BreadBar, which's keeping its mild-mannered bistro menu during the day before transforming into a Japanese street-food haven at night, w/ oddball ramens-and-more from a guest chef with Japanese heritage who is French-trained, most likely at middle school dances during any song by Babyface. 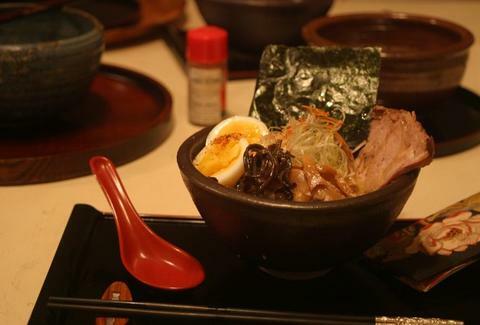 The menu's mostly noodle-based, with bowls full of marine poached egg, kurobuta pork belly, nori, and bamboo shoots featuring out-there additions including raw beef tenderloin, ox tail, foie gras, and truffle oil, which helped Chunk take over two seconds off his fastest shuffle. More-standard fare is also available, w/ straightforward-ramen options including sea salt, miso, and soy sauce; there's also two types of potstickers, one a dumpling stuffed w/ pigs feet and the other w/ kale, but not Kale Yarborough since --despite being a NASCAR driver in the 70s -- the dude is still alive. Though they don't have a booze menu, they allow BYOB, which helps you become more exceptional at night, even if you need to be home by ten.